Dating from October 1949 our image shows members of the Youth Club gathered in the sunshine and the majority have been identified. 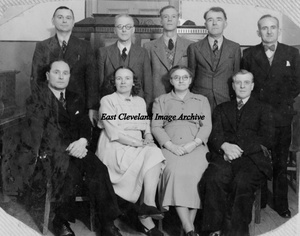 Back row: Tom Andrew, Abel Roberts, Brian Yarker, Irene Fowle, Gordon Fowle. 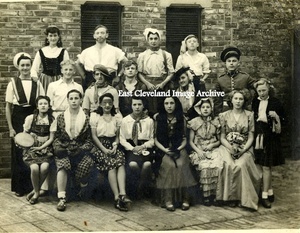 Front row: Eric Yarker, Margaret Drew, Bunty Hindmarsh, Margaret Wood, ? 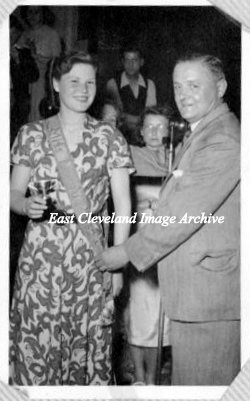 ?, Margaret Peel, Geoff Ditchburn. 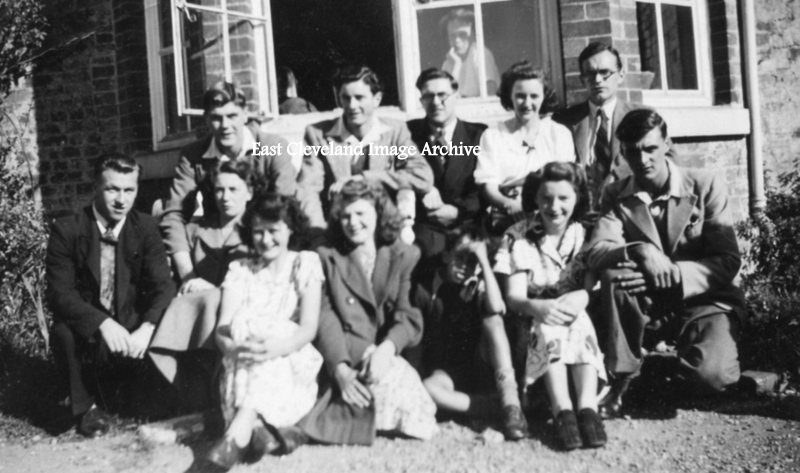 Can anybody assist with the missing name or perhaps the name of the face in the window, or even the occasion? Image and names to date courtesy of Helen Cook (nee Fowle). Were You A Budding Actor? Help us name these people please. we know the first person seated on the right is Bertha Bell and next to her is Jean Bosomworth. 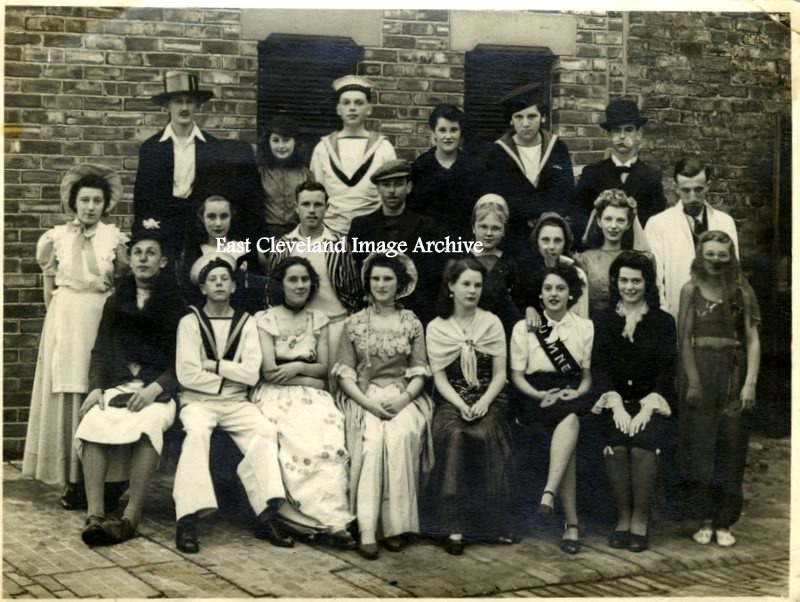 Another drama group to help us name, I think the second seated on the left is Audrey Winspear (nee Magor). 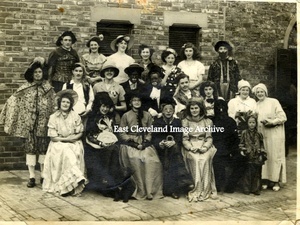 We know the third from the left middle row is Jacky Noble can you name anyone else? Back row (left to right): Mr H. Norminton, Mr C. F. Tidman, ? ?, Mr G. Hebditch, ??. Seated left to right, ? ?, ??, ? ?, Mr John Verrill. Help is needed to complete the names. Image courtesy of Loftus Youth Club. Miss Loftus being presented with her trophy and sash by a Loftus Urban District Councillor. 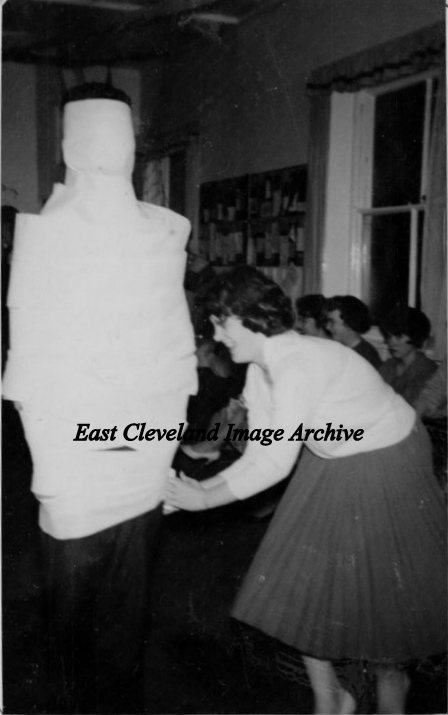 We think this looks like Miss Rita Ward (later Unthank) but can anybody confirm? Also we need help with the name of the Councillor. 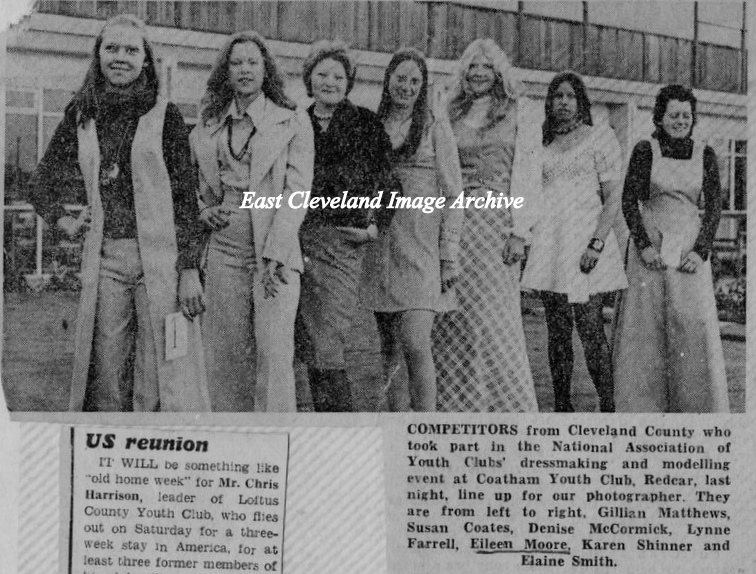 Can you remember these girls and where are they now? I would have loved to have seen them at this dance; dinner jackets for the men and long dresses for the ladies! Were you there, can you tell us about it? 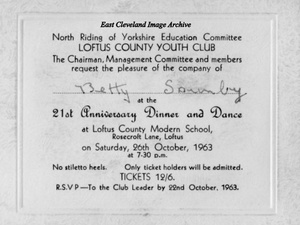 Invitation loaned to us by Loftus Youth Club. Is this for a fancy dress or for a Youth Club performance? Who is making the mummy can you name her? 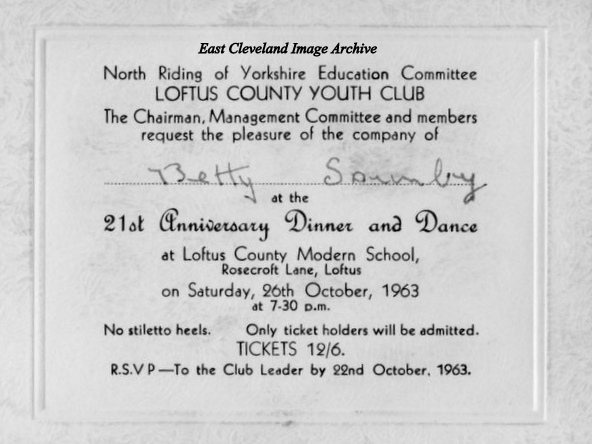 Thanks go to Loftus Youth Club for the loan of the photograph. Do you remember Donald Peers? 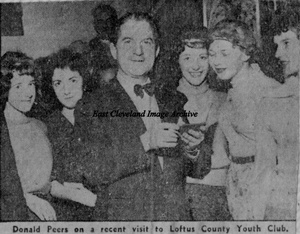 Pictured at Loftus County Youth Club when he came to open their Christmas Bazaar; Donald Peers, singing star was presented with a pair of cufflinks.